We are not going to cover all aspects of the South African Water legislation in this article, we are only going to look at some fundamental principles, which might affect the local borehole user, as well as other farming activities. In the preamble to the National Water Act it is recognised that water is a scarce and unevenly distributed national resource, which occurs in many different forms and are all part of a unitary, inter-dependant hydrological cycle, whereas previously groundwater and surface water were treated differently. As such the National Water Act states that there will be no ownership of water (surface and groundwater), only a right to use for basic human needs and the environment. The volume, quality and sustainability of water necessary to sustain human life, and ecological functions on which human life depends, will be reserved in such a manner that the long-term sustainability is not jeopardized. The water quantity needed to sustain the basic human and environmental needs, will be called and will have absolute priority. The quantity needed to sustain this life will enjoy priority in a catchment and will be calculated and reserved (the reserve) before any additional water rights are allocated for activities such as crop irrigation. To effectively try to manage the water quantities utilized, the act provides the directive for the registration of water use. All water users, who do not receive their water from a service provider, local authority, water board, irrigation board, government water scheme or other bulk supplier and who are using water for: Irrigation; Mining purposes; Industrial use; Feedlots, or In terms of a General Authorisation; should register their water use. This covers the use of surface and ground water. Permission to use certain quantities of water will be allocated for a certain time period (maximum 40 years) and should be reviewed at least every 5 years. The National Water Act however, allows a person to use water for reasonable domestic purposes directly from a water resource to which he or she has lawful access. It also allows a person to take water for small gardening (not for commercial purposes) and the watering of animals (excluding feedlots) on land owned or occupied by that person, from any water resource which is situated on or forms a boundary of that land. This only applies if the use is not excessive relative to the capacity of the water resource and the needs of other users. This means that most users using groundwater in towns and cities and those users with windmills on their own properties need not register. If you are unsure about your water use registration obligations, contact DWAF or a professional consultant and ask. Water quality management needs to be implemented in catchment areas. Institutions or individuals that is directly or indirectly responsible for the pollution of both surface and groundwater will be held responsible for the rehabilitation of such resources. This is especially important in areas where major industrial or mining activities takes place and could also have an impact on irrigation where the use of fertilizer could impact on underground water resources. 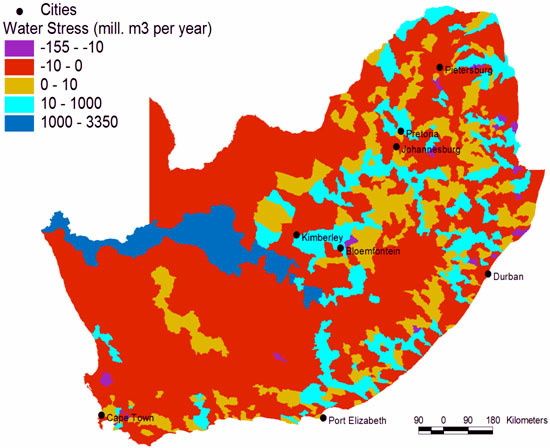 2005 Annual water balance in South African catchments based on data from the Department of Water and Forestry (Source: Colvine et al. 2009, Water Resources and Climate Change Case Study, South African Risk and Vulnerability Atas).